Would you be willing to let a telepresence robot take your place at work as proposed by Anybots corporation? The QB robot from Anybots, available this fall, lets employees work from home through a robot proxy. (CNN) -- When Trevor Blackwell, CEO of a company called Anybots, wants to know what his employees are up to, he sends a robot to their cubicles. "I can see if people are busy on something -- and then won't interrupt them," he said this week. "Or, you know, if they're doing something that looks interesting, or if they look stuck, I'll have a conversation with them." This isn't your standard "Office Space" conversation. Blackwell boots up a "telepresence robot" -- which looks like a combination between a Segway and Johnny 5 from those "Short Circuit" movies -- to talk to his employees from his home, 10 miles from Anybots' office in Mountain Home, California. 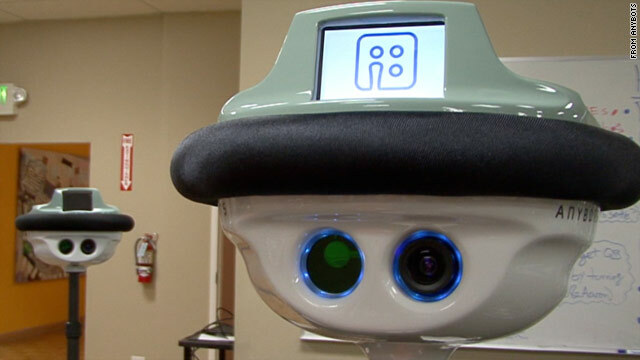 The 5-foot-6, 35-pound robot contains a video camera, a still camera and a microphone. From a laptop, Blackwell can see everything the robot sees. He hears what the robot hears. And, when he talks, the robot projects his voice. He drives the robot, called QB, with his computer keyboard. A sensor stops it from running into doors and tables. The robot zips around at 3.5 miles per hour, and its battery lasts up to 8 hours, or the length of a typical human workday, he said. Blackwell says that this is how the office of tomorrow will work. Within a year or so, he says, every office in Silicon Valley, California, will have about one telepresence robot for every 10 employees. His is one of several companies trying to push this idea of the robot-infused workplace into reality. Others companies include RoboDynamics, WowWee and iRobot. Anybots' QB robot is available for pre-order now. It ships to customers in the fall. At $15,000, the QB is designed for commercial clients now, Blackwell said, but he thinks consumer robots aren't too far off. People could use them to go on remote vacations, he said, touring the streets of a faraway country or interacting with the locals without ever leaving their bedrooms. CNN spoke with Blackwell about the QB, the robot-laden future of the modern American office and robot-commuting etiquette. The following is an edited transcript. What is a telepresence robot? A telepresence robot is like a two-way video-audio system on wheels. So you can see people; they can see you. You can talk to people, they can talk to you, and you can move it around remotely. So you can drive into peoples' cubicles, drive into the conference room, drive into the lab, drive out to see what they're doing. Why would someone need that? People that are working with a remote team need it the most -- so, often there's a team that works together where most of the people are together in one place, but one person is in Europe or on the other side of the country. So it's really about letting the remote person join in the conversations wherever the conversations are happening. In general, how have the employees accepted it? For the first minute or so, we're talking about, "Hey, I'm in a robot." But after that, we basically get down to business, to whatever it is we were going to talk about. I talked to a couple other people who worked in robotics, and they said one of the big challenges is getting everyday people to accept a robot wheeling around in their space. I wonder what you make of that. Yeah. It's a big challenge. It has a lot to do with the design of the robot. A lot of robots in the past have been big, heavy beeping things, where everyone had to get out of their way. The new generation of robots is light and unobtrusive in an office environment. That makes a big difference. Tell me about the design of this particular robot. It doesn't look exactly like a person. Is that intentional? It was somewhat intentional. We actually had a previous version that did look more human-like: It had more of a torso and more of a face on it. And it was confusing, because people wanted to be talking to a robot, and they wanted it to have a robot personality, so we ended up with something that sort of occupies the same space as a person -- it's 5½ feet tall, you know, and ... people will include it in a circle of conversation around a white board. Is this a new area of research, or has it been around for a while? It's been around for quite a long time, but only for very specialized uses because you couldn't do it over a long distance. For 20 years or so, this kind of thing has been in use for bomb-disposal robots, where it might save your life to be 100 yards away. But it's only recently that it's been practical to do it over the Internet, because the Internet was fast enough to do it. You're streaming video. I read that the receptionist in the Anybots office sometimes telecommutes [via robot]. What is that like for people who come in from outside the office and are greeted by a robot? Very quickly, her personality comes through, and she puts the visitors at ease and offers them drinks. It's all about the way people approach it. If you approach it as "We're here to have a business conversation," it quickly gets to that. Can the receptionist robot actually go get people those drinks? The robot doesn't have hands. So, you know, it's really just showing them where the fridge is. But that seems to be good enough. Mainly just more wide use of it in more situations. If people are working all day in an office, it's definitely nice if you can save them a commute. Do you see uses for this outside of the office? Definitely. One of the big uses is in factories. We use it in our factory, which is actually just on the other side of town. But so many factories are in Asia. The advantage is, you can have your most experienced engineer go look at that thing coming off the production line instantly, rather than having to send someone there who has to be a generalist and has to spend a day flying there. It's a fascinating idea. We haven't really seen it happen yet, but I'm sure that it will. Like a lot of things -- like when e-mail first came out, people only used it for sending serious documents, and now people will use it to send one-sentence things to the guy on the other side of the office. They do that all the time. So I think, as it becomes more common, people are going to use it for more frivolous purposes. Do you warn people when you're coming to a meeting as a robot? I don't feel I have to. That's kind of my prerogative to not have to drive somewhere. Do you think, eventually, this will be a consumer technology? Yes, both we and other companies are working on sort of lower-cost, consumer versions. How far out are those? There is one available now called Rovio, that's like a $300 thing. It's small. It's like 6 inches tall. So it's better for talking to kids than being taken seriously in an office environment. Are these robots going to change the relationship between people and machines? People will just think of it as just another gadget, like they think of their cell phone. They don't think very much about the fact that they're carrying this amazing piece of technology in their pocket all the time. It's just something everyone does. And I think telepresence robots are going to be like that in five years. It's just one of those things you expect to see. What's the biggest technical challenge in this field? Definitely, Wi-Fi range is one of the big problems. When you run out of Wi-Fi range, it has to stop and back up a little bit. And the big change there that's coming is that WiMAX, or 4G, will be deployed in most American cities, and then telepresence robots will be able to be deployed anywhere in the city. Have you used the QB outside? We take it out the front door all the time. ... We have to set up a big antenna to make it work. We've driven it around outside and talked to people. It's quite pleasant. Is it rugged enough to handle outside terrain? We designed it thinking about offices, but it actually does very well outdoors. It has 12-inch-diameter wheels, sort of the smallest size of bicycle wheels. And so it handles outdoor terrain pretty well. It's shipping in the fall, and you can pre-order it now on the website. How many pre-orders have you gotten? We're not releasing numbers yet. Have you started producing them? Yeah, we're in pre-production, and we've built 25 of them so far. And there are a lot more coming in the fall. Yes, why not let the robot be at the office while I work at home?